World leader heavy duty GPS tracker used by: UPS, Nissan, Rolls Royce, Ferrari, Vodafone, Telefonica, US military and more. What is so unique about Trackimo? A reliable tracker that actually works. Proprietary Patented technology +3G coverage, others use old 2G. Easy, working out-of-the-box worldwide both indoor and outdoors. Track: Cars, trucks, generators, fiels equipment, shipments, drones..
Move alert, speed alert, geo fence crossing alert, 5 years history. Faster more expensive CPUs, newest more accurate GPS chip. Battery last up to 30 days in battery save mode. 4 tracking modules, indoors and outdoors: GPS, A-GPS, GSM, Wi-Fi. Keep your valuables & cars safe, get Trackimo tracker now ! 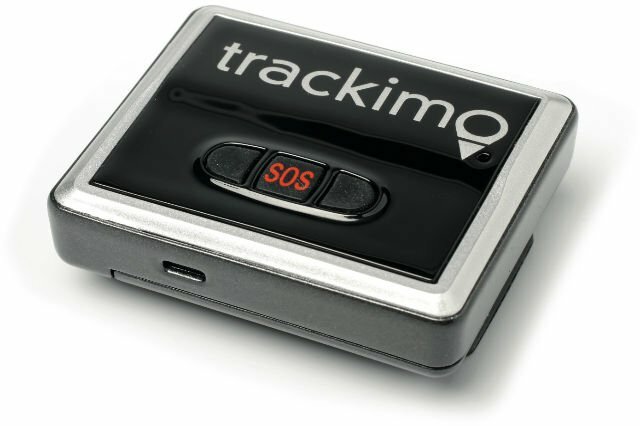 Trackimo® is an intelligent, GPS-GSM tiny device allowing you to find and track your precious things in real-time, automatically alerting when sensing distress signals exceeding speed settings, leaving or entering a fenced zone. Trackimo's location is accessible through any computer or mobile device from any spot in the world. With unique Revolutionary GPS/GSM/Wi-Fi/BT Hybrid tracking, Trackimo use 4 different technologies to accurately Locate anything Worldwide. GPS utilizing Global Positioning Satellite technology to locate outdoor within 30-150 feet (10-50 meters) accuracy. Wi-Fi is used for indoor tracking and BluTooth for the last 10-60 feet (3-20 meters). Trackimo 3G GPS Tracker is including SIM card loaded with 1 year international cellular service and working out of the box. This device comes with Trackimo Vehicle/Marine Kit, a power stabilizer and regulator to ensure constant power supply and optimal performance for the Trackimo device. Must be used for continuous charging of the Trackimo GPS tracker. You can monitor multiple devices remotely from a single view on your smartphone, computer or tablet. Simply attach your Trackimo to the person or thing you wish to locate and see their location information from the website or mobile app. Device is using GPS satellites and Cellular tower triangulation as second choice to compute the location of the device and report its location via the GSM cellular worldwide network. Best suitable for: Cars, trucks, boats, motorcycle, ATV, construction and heavy equipment, golf carts and more. Low Monthly Service Cost - Only $5 per month after the first 12 month service period is over. Trackimo offers the lowest monthly service cost of any consumer tracking device worldwide. No roaming fees. Full customer service and phone support by dedicated experts. *The monthly service pays for the worldwide SIM card using the GSM network to report the real time positioning of the device (just like AT&T etc. has monthly fee). Including safety fuse to protect the car and the device. ©Copyright 2018 by Trackimo. All Rights Reserved.